Jin S. Hahn, MD, Associate Professor of Neurology and Pediatrics and Chief of Pediatric Neurology at Stanford School of Medicine, likes to have access to the most current medical information. So when he saw a teenager recently with ophthalmoplegia who had an MRI revealing subtle changes in the orbital region, he conducted a search query online at www.skolar.com (Stanford Skolar MD), a resource developed by Stanford University School of Medicine. The search quickly yielded full-text articles describing Tolosa-Hunt syndrome in children, its neuroimaging findings, and current treatment options. Dr. Hahn prefers the integrated drug databases on Stanford Skolar MD because he has found they supply more information on children than other databases. By entering key words or phrases, the program provides a variety of results from multiple references including textbooks, full-text journals, evidence-based guidelines, as well as Medline, drug, and ICD-9 databases. He uses it for day-to-day practice and finds it particularly helpful when he is on the consultation service. Stanford Skolar MD operates on the premise that the best time to learn is at the bedside when a physician is trying to solve a patient's problem. Many educators believe that this may also be the ideal time to offer continuing medical education (CME), providing information precisely when it is needed. In addition to allowing physicians to accumulate CME credit for their work, the program keeps track of prior searches so they can be easily reviewed. Today there are many more types of continuing education opportunities available for neurologists. The newest form of CME credit, Internet CME, is growing rapidly. The Accreditation Council for Continuing Medical Education (ACCME), which accredits institutions and organizations that sponsor CME for physicians, is in the process of drafting guidelines on Internet CME. The ACCME is comprised of seven member organizations including the American Board of Medical Specialties (ABMS). Edgar J. Kenton III, MD, Chair of the AAN Practice Committee and one of eight directors of the American Board of Psychiatry and Neurology, serves as a delegate to the ABMS and to the ACCME Council. He also sits on the ACCME Task Force on the Commercialization of CME. He said that the new guidelines will address separating promotion from education, disclosure of relationships and commercial support, ethics, and usability. What are some of the sites neurologists can go to in order to find online learning opportunities that provide CME credits? The AAN offers the self-assessment tool, QUINTESSENTIALS, for CME credit at its Web site, www.aan.com. Modules on Stroke Prevention and Migraine Headache have been designed to help neurologists compare their practice habits to best care standards, expert opinions, and their colleagues. Initially, benchmark data are used to document and evaluate practice habits and policies toward a specific disease state. These modules eventually guide physicians through the process of documentation, evaluation, and measurement of the success of changes made in their practice. Robert Yapundich, MD, a neurologist in private practice in Hickory, NC, has participated in both the Stroke Prevention and the Migraine Headache modules. He said he found the experience very useful. Dr. Yapundich serves on the board of a local physician hospital organization (PHO) and encourages its member family practitioners to take the Migraine Headache module. “It could be beneficial as a quality control tool, affecting the use of management policies of PHO contracts with local employers and insurance carriers,” he said. The migraine program was, in fact, launched together with the American Academy of Family Practice and is being offered online at their site as well. The largest online CME site is maintained at eMedicine (www.emedicine.com). The site offers 10,000 hours of Category 1 CME with original content written specifically for eMedicine by 7,500 contributors. 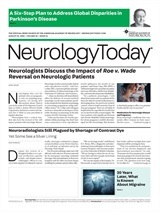 The neurology offerings include 400 articles encompassing 600 hours of online CME. In addition, new sections are being developed on EEG, EMG, EP, and sleep, as well as a full radiology reference with a large section on neuroradiology. Each article is written by up to 10 authors and undergoes rigorous review by four physician editors and a pharmacologist. Nicholas Lorenzo, MD, one of the co-founders and Chief Editor of this publication, noted that up to 8 percent of physicians accessing eMedicine are neurologists – the second highest users of the site, percentage-wise. Physicians opt for online CME for three reasons, he said – the convenience of being able to do it when they have the opportunity, the large variety of high-quality CME, and the ability to access current information on new medications and procedures. “New printed material takes months – and usually years at best – to arrive, whereas the Internet allows this material to be presented very quickly,” Dr. Lorenzo added. Another advantage he cited is that of last-minute access. Since the site e-mails a certificate back to the physician immediately, those who need to meet pressing deadlines for their CME requirements can obtain their certificates at the time they earn them. And for those physicians who like handheld devices, he added, the entire library is downloadable to a Palm or Windows CE handheld; wireless access will be launched soon. There are other benefits. Home-based CME can be pursued at the physician's own pace during unscheduled hours of the day and, unlike live meetings, a physician can go back and review those sections that are of greatest interest. The online opportunity also appeals to busy physicians who want to save the cost of travel and hotel as well as conference registration fees. On top of these, the costs incurred for being away from the office are often cited as an added burden for physicians struggling with reduced incomes. Bernard M. Sklar, MD, who has a master's degree in medical informatics, has created and maintained a database of CME sites for the last five years. As of June 2002, there were 209 sites, 10,952 courses, and 18,266 hours available; of these, 15 sites (7 percent) have some instruction aimed at neurologists. Many of the courses in Dr. Sklar's database are available in searchable form at The Professional Learning Center, www.professionallearningcenter.com. Queries for Dr. Sklar's database can be submitted by keywords and medical condition, specialty, cost, credit hour, and even type of online CME instruction. A search under neurology in June, for example, yielded 78 courses, 49 of which were free. In addition to the CME Center and other news, journal, and educational offerings, this site offers free access to Stanford Skolar MD. Online CME sites vary, including text only, text and graphics, slides only or with text, and audio or video. Newer, more interactive platforms are being developed. Dr. Lorenzo said that eMedicine is launching a new product for physicians with broadband connections (cable modem, DSL lines, or better) that will have near DVD-quality video lectures presented by current thought leaders. The mechanism of awarding credits also varies. Some programs require a synopsis describing how the educational experience was relevant to practice. Others follow traditional print standards and request completion of a multiple-choice test and mandate that a certain percentage of correct answers be achieved. For those neurologists who prefer immediate feedback, the online versions typically provide instantaneous results. Despite the broadening scope of online CME opportunities, however, as of 2001, online CME accounted for less that 4 percent of all CME. Why have so few physicians tried to earn CME online? There are several reasons. Many are not aware of the variety of offerings available. Physicians who are not computer literate or who are uncomfortable using the Internet are clearly not good candidates for this type of learning. Dr. Yapundich added, “The online programs are also a bit more inconvenient in the sense that they can only be completed in front of a computer, whereas print materials are portable.” Other physicians dislike the lack of social interaction, preferring live CME experiences. Lastly, the cost of programming plays a clear role in physician preference. While some online CME content is free, other sites charge fees from $5 to $25 per CME credit hour. In contrast, Dr. Sklar pointed out, most live CME, especially at the hospital, is free. But those who take advantage of online CME programs say that with continuing improvements – such as better audio, video, and more interactive programming – more neurologists will see its merits in time.